The Wall Street Journal bestseller—a Financial Times Business Book of the Month and named by The Washington Post as “One of the 11 Leadership Books to Read in 2018”—is “a refreshingly data-based, clearheaded guide” (Publishers Weekly) to individual performance, based on a groundbreaking study. Each of Hansen’s seven practices is highlighted by inspiring stories from individuals in his comprehensive study. You’ll meet a high school principal who engineered a dramatic turnaround of his failing high school; a rural Indian farmer determined to establish a better way of life for women in his village; and a sushi chef, whose simple preparation has led to his unassuming restaurant being awarded the maximum of three Michelin stars. Hansen also explains how the way Alfred Hitchcock filmed Psycho and the 1911 race to become the first explorer to reach the South Pole both illustrate the use of his seven practices. 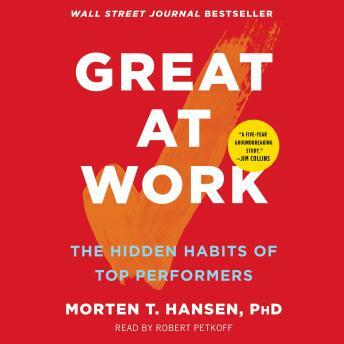 Each chapter “is intended to inspire people to be better workers…and improve their own work performance” (Booklist) with questions and key insights to allow you to assess your own performance and figure out your work strengths, as well as your weaknesses. Once you understand your individual style, there are mini-quizzes, questionnaires, and clear tips to assist you focus on a strategy to become a more productive worker. Extensive, accessible, and friendly, Great at Work will help us “reengineer our work lives, reduce burnout, and improve performance and job satisfaction” (Psychology Today).